Path of exile expansion, Atlas of Worlds, and the accompanying essence challenge league. Here are the ten things that really stood out for me when speaking with him, from new content to performance improvements. So, let’s talk maps. 1. The expansion has an end-game focus. Chris mentioned that this newest expansion would have an end-game focus, as current end-game players may feel a bit underserved. 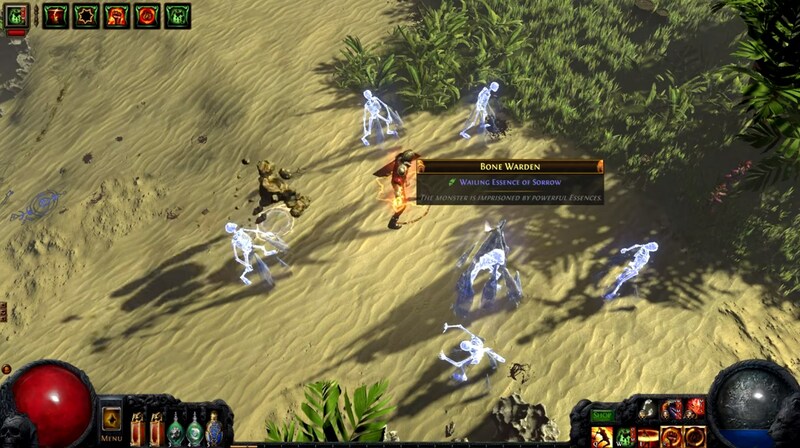 Now, experienced players will have a new way to occupy their time in Wraeclast. 2. Zana plays a role. You remember Zana, right? She’s your favorite Master Cartographer and one of the eight forsaken masters. Zana will encourage you to explore the maps, find out how they’re being created, and – most importantly- discover who’s creating them. With Zana involved, you can probably assume this expansion is all about maps. You assumed correctly! Before, a map was a single-use item that allowed you to access a randomized instance. Well – that’s technically not changing, but now there’s a lot more to it. Once you complete a map, it will be marked on your Atlas. What’s the Atlas? It’s a map for your maps, of sorts. 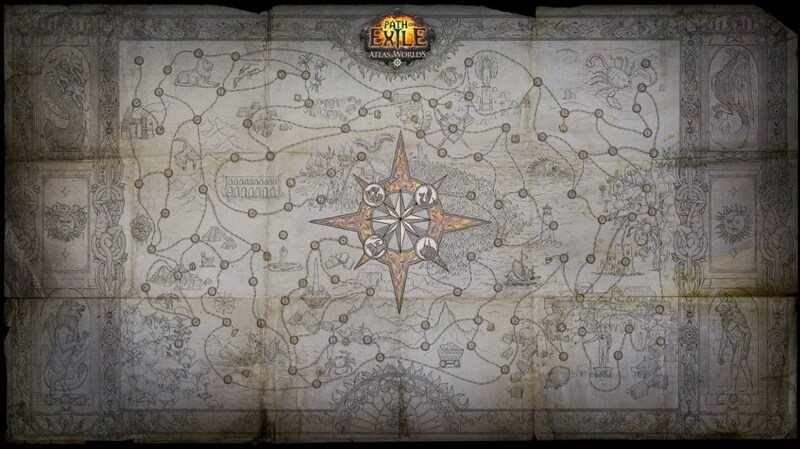 Maps now connect to one another, and they all lead to a single compass rose in the middle. Hmm – that seems important? I’ll talk a bit more about that later. As you can see on the Atlas, there are different map types. There are maps located in a graveyard, maps located in forests, and so on. Certain new items may only drop in certain map areas. Oh, you can now use an Orb of Alchemy to upgrade your map to a higher tier. You'll use a Shaper's Orb to upgrade a map on the Atlas by five levels. 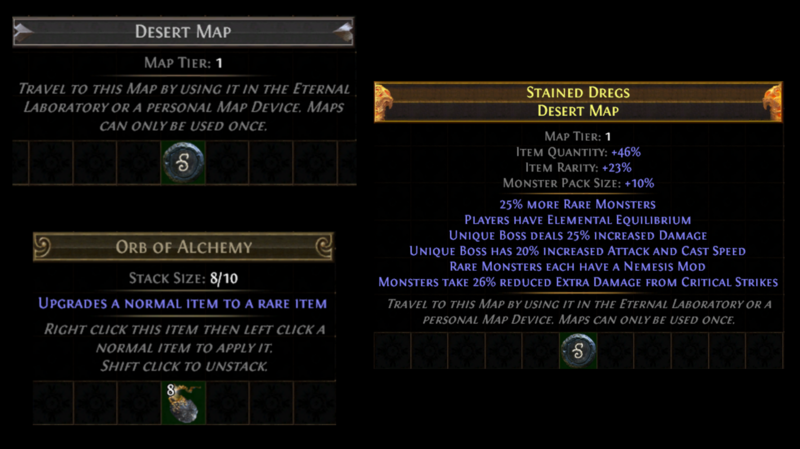 An Orb of Alchemy can be used to add upgrades to a map, as seen in this screenshot, but the tier remains the same. There’s also a Cartographer’s Sextant, which you can use to apply certain mods to a map on your Atlas. Once applied, a red circle will appear on your Atlas, and it will tell you exactly what mods are applied to the maps in the circle. It might be great, it might be horrid. Either way, the mods will remain on the selected maps for five visits. 4. Maps are being added and revamped. Previously, there were 70 maps in the game. In Atlas of Worlds, there are 30 more, and the previous maps are being upgraded. Chris described the existing map tiers as a pyramid shape, with a lot of lower-tier maps, but less mid-tier instances. As you can see on the Atlas, there are now less low-level maps and more challenging encounters. And I haven’t even talked about the map design. It is amazing. It’s amazing. 5. The new maps look really awesome. Like, really awesome. Let’s face it, Wraeclast is a little gloomy. The new maps, however, are vibrant, dream-like, colorful, vivid, and just wonderful. I saw an oasis with lush grass and pools of water. I saw red rock mesa (a favorite of Chris) with bright rocky cliffs. I saw pools of lava, oceans, and a ton of variety. Chris mentioned that these new maps were the design team’s first dive into height changes. By that, I mean you could be high on a rampart fighting enemies and see other creatures and paths down below. Eventually, you’ll be able to descend from the high wall and explore the area you were previously viewing from above. He also mentioned the new juxtaposition between indoor and outdoor areas. A new random generator will combine these two areas in the map worlds, mixing the order of city structures with the organic nature of cliffs and ravines. Very cool. 6. There are new map bosses. As you advance through all these map encounters, battling boss after boss, you’ll eventually end up in the single golden compass rose in the middle of the Atlas. There’s someone there – the controller of maps himself. 7. You’re going after the Shaper. 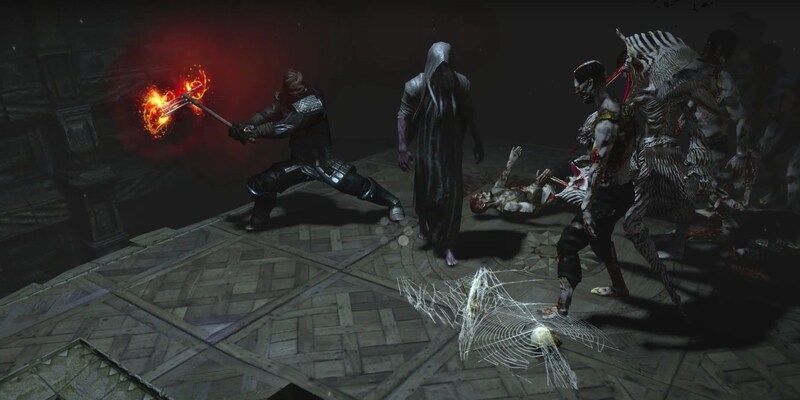 Yes, the Shaper is the figure highlighted in the above game trailer. We don’t know too much about him – just that he’s very powerful, he hates the real world, and he has a weird beard. He’s hiding out in the void, and you’re coming to get him. 8. The Four Guardians stand in your way. The Shaper has four guardians protecting his hideout, and you’ll need to defeat each one. Each guardian encounter is basically a tier 16 map, and completing the map will give you a key. The four guardian keys can be combined to access the Shaper. It’s worth mentioning that these keys can be traded. So, you have new maps, new bosses, a terrifying new foe, tons of new items – what else could you want? How about a new challenge league. 9. The new challenge league is all about essence. In the three-month Essence League, you’ll encounter groups of monsters trapped in different types of essences. By breaking them out and defeating them, you can steal their essence and craft powerful items. Essences will have different tiers and different rarities, and the type of essence will impact the monster’s fight mechanics. Pretty cool, right? But, there’s more to it. When talking to Chris, he emphasized one thing about the Path of Exile community. You all like risks. Rolling the dice and having a potentially awesome scenario or a potentially horrifying scenario is something players enjoy. So, there’s plenty of that in the Essence League. When you apply an essence to an item, it will replace the item's mods – for better or for worse. You may have a decent head piece that you’re interested in upgrading with an essence – but you might lose the item’s awesome mods and actually add on a few unfavorable ones as well. The choice is yours. Also, there’s a little something called Remnant of Corruption. This item will corrupt a monster trapped in essence, modifying it unpredictably. In the example I was shown, a Screaming Essence of Wrath was modified to also include an Essence of Anguish. The monster will be more difficult to beat now, but you’ll get double the rewards. Of course – there are risks. I saw an example of a Screaming Essence of Misery modified into a Screaming Essence of Horror. This caused all the monsters around the player to unfreeze and start attacking the player. The worst part? No essences dropped from any of the monsters. 10. This is the best game performance of any release yet. 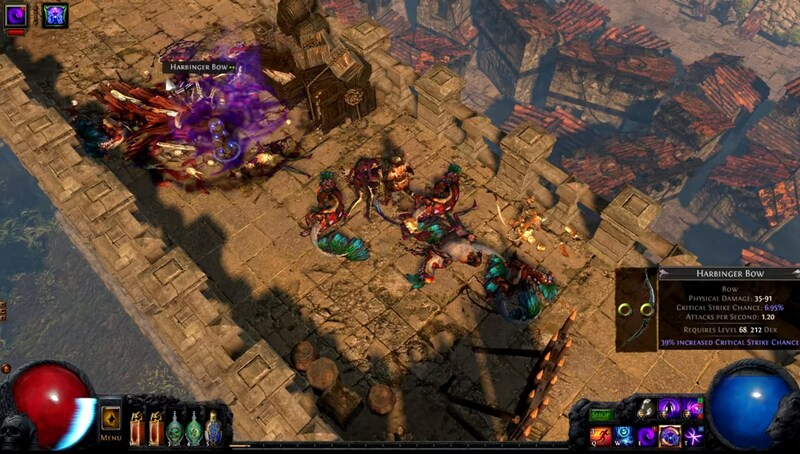 Grinding Gear Games has multi-threaded Path of Exile’s game engine to take full advantage of CPUs. In larger fight situations, your frame rate could be twice as high – depending on your PC. Atlas of Worlds and the Essence League are coming September 2, 2016. This new expansion is exactly what end-game players have been waiting for, and it’s only a few weeks away. If you’re interested in learning more about Path of Exile, be sure to stop by the Path of Exile Wiki on Gamepedia. It includes a ton of awesome content about in-game items, microtransactions, bosses, and more.